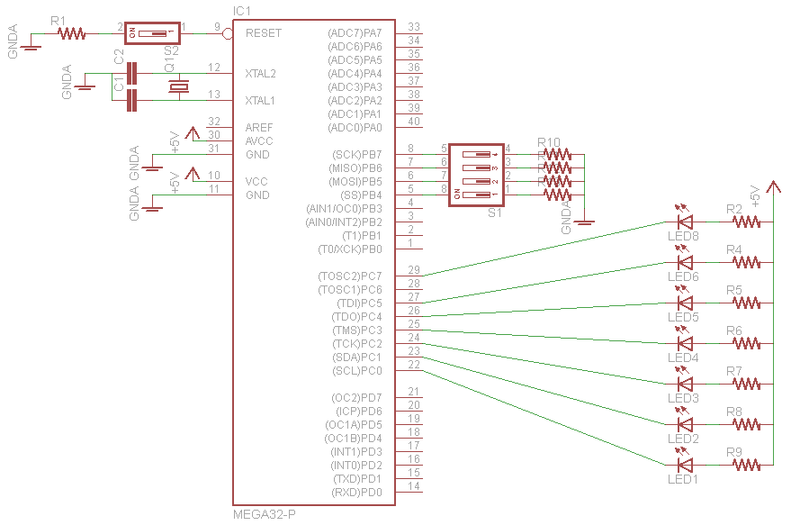 Hi i have built an avr programmer according to the circuit diagram of fischl. i have installed the corresponding driver. now my device is displayed on the device manager as Libusb win 32 device. under this usbasp is shown. but i can't program atmega 32 ,or atmega 8 with this . i didn't connected slw_sck in my pcb. i have also didn't use Tx Rx gnd pin of the pcb. the pcb is shown in picture. when i read microcontroller in extreme burner, it says found usbasp on port . but can't burn program. i have checked circuit several times sck ,mosi, miso, reset and ground pin but result is same. You could use avrdude without hex file, and with the -vvv option. Have you tried a 'real' USBasp programmer on your computer, to be sure that it is possible. Did you also set the fuses the same as the USBasp programmer? How did you program your programmer, and did you remove the jumper for programming it afterwards? ya i tried real usbasp programmer and it has slw_sck sorted alltime. i set the low fuse as 0xEF,high fuse 0xC9 for atmega 8A microcontroller. So far so good I think. The jumper for "slow SCK clock" is not needed most of the times for newer chips. The ATmega8 and ATmega32 are older chips, so you could set it. In the official fischl.de schematic, to program the programmer, a jumper JP2 (self programming) should be used, and that jumper must be removed to be able to use it as an USBasp programmer. I wander how you programmed it. Check all connections careful once more. Are your zener diodes soldered the other way around ? If so, do you have proper load capacitors in place? Can you show a circuit schematic, detailing the clock section? Are you absolutely sure you changed the fuses to H,L: 0xC9, 0xFF ? Reason for asking is that if you accidentally changed to something else you might have set "external clock" (rather than "external crystal osillator"), and then the AVR needs an actual clean square wave as a clock. Remedy for most "locked out" AVR cases is to inject a clean square wave on the clock pin. There is a tutorial here on AVRfreaks with the details. Look in the Tutorials section for something by user 'clawson' mentioning "locked out" or similar. EDIT: Madness! The post I responded to has disappeared. Sorry Johan. I split that post off the unrelated 5 year old thread while you were typing and unfortunately there isn't a working "graft onto" feature that I can use to remedy the situation.